Image caption Swedish bookseller Gui Minhai, who is detained in China, gave a video interview in which he condemned Stockholm. It's not clear if he was speaking under duress. State media in China have accused Sweden of a movie-style plot to spirit away detained bookseller Gui Minhai, who has Swedish citizenship. The Hong Kong-based businessman was seized on 20 January while travelling to the Chinese capital, Beijing. On Friday a video interview was released in which he accused Stockholm of "sensationalising" his case. A Chinese tabloid condemned Sweden for trying to "demonstrate its diplomatic heroism by 'saving the bookseller'". Mr Gui, who was briefly freed from custody last October, has been in and out of Chinese detention since 2015, when he went missing during a holiday in Thailand. What is the Chinese press saying? The Global Times, a nationalistic paper, accused Sweden of tricking Mr Gui into a plan designed to free him from Chinese custody. It says the bookseller was banned from leaving the Chinese mainland over allegations he had been involved in "illegal business". The 53-year-old was arrested while taking a train to Beijing from Ningbo in eastern China, where doctors had said he might have the neurological disorder ALS, a type of motor neurone disease. He had been scheduled to see a Swedish specialist in the capital, and was arrested in the presence of two Swedish diplomats travelling with him. In an editorial headlined, "Is Sweden making 'Saving Gui Minhai' movie? ", the Global Times says Stockholm "wanted to arrange Gui's 'escape' by breaking Chinese law". Earlier it gave more detail of the allegations against Mr Gui, saying he was suspected of "illegally providing national secrets and intelligence to overseas groups". The Global Times accused the Swedish foreign ministry of "craving the limelight in the EU and the West", and said it had made itself "a laughingstock". Xinhua, China's state news agency, reported that Mr Gui had "applied to authorities and asked to speak the truth before media". What's the problem with the video? In the video, Mr Gui says he was pressured into leaving China by Swedish officials. "Because they were instigating me non-stop, I fell for it," he says. Human rights groups including Amnesty International have warned that the interview has the hallmarks of a forced confession. "Looking back, I might have become Sweden's chess piece," Mr Gui says in the footage. "My wonderful life has been ruined and I would never trust the Swedish ever again." Katarina Byrenius, a spokeswoman for Sweden's foreign ministry, has said the video "changes nothing". "We continue to demand that our citizen be given the opportunity to meet with Swedish diplomatic staff and medical staff," she wrote in an email to Reuters news agency. "It's almost certainly a forced confession," said William Nee, a China researcher with Amnesty International. "The fact that he's kind of repeating talking points that the [Chinese] government wants to put out ... and as far as we know he's in incommunicado detention. He doesn't have lawyers of his choice or consular access right now," he told Hong Kong public broadcaster RTHK. Mr Gui, who has published books on the personal lives of Chinese Communist Party leaders, has spent much of the past two years in Chinese custody. After his disappearance, there were allegations that he had been abducted by Chinese agents across international borders in an extrajudicial process. 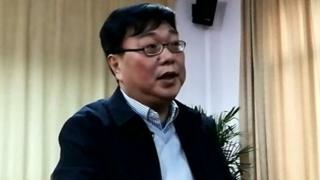 Chinese officials, however, say Mr Gui and the four other men all went to China voluntarily. The bookseller ultimately confessed to being involved in a fatal traffic accident more than a decade earlier - a confession supporters say was forced. Human rights groups believe the publishers are victims of a crackdown on dissent against China's ruling Communist Party.